A note: Only use this guide if you need a “loose” chip. 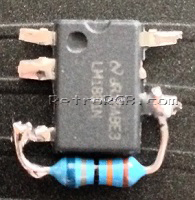 Using a surface-mount version will be a bit smaller and in most cases be a better solution. You can find more info on that in this guide. Also, if you’d like, you can buy a pre-made sync stripper on this page. 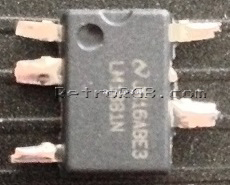 Please note that the LM1881 outputs TTL-level sync. If you’re going into a device that’s expecting 75 ohm video-level sync (such as the framemeister), then you’ll need to add the 470ohm resistor to the output line. There’s more info at the bottom of the page and for more information on sync, please see the main sync page. 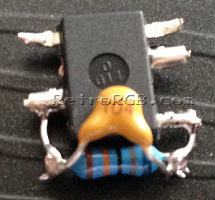 – Turn the circuit over (note the orientation of the pins!) and get ready to solder the capacitor. 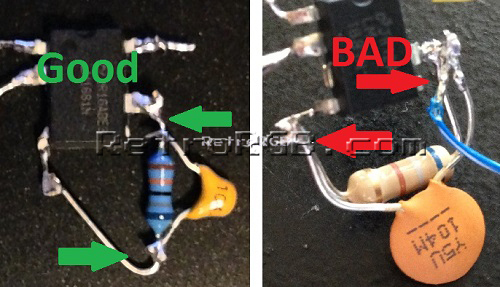 This part is a bit tricky…trim and solder the 0.1uf capacitor to the resister, however you need to get the capacitors legs as close to the actual resister as you can. 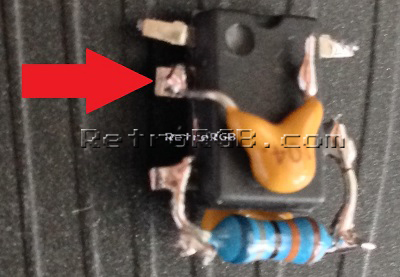 You need to make sure the capacitor legs aren’t touching anything else except the resister. Then, fold the capacitor over onto the LM1881. – Next, turn the chip back over to it’s original orientation (note the circle in the upper left). Solder the second 0.1uf capacitor to the middle leg of the LM1881. I trimmed and bent the capacitor’s leg, so it could lay flat on the LM1881. 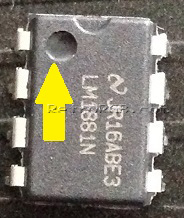 Please note the capacitor’s other leg is above the LM1881, not touching it. 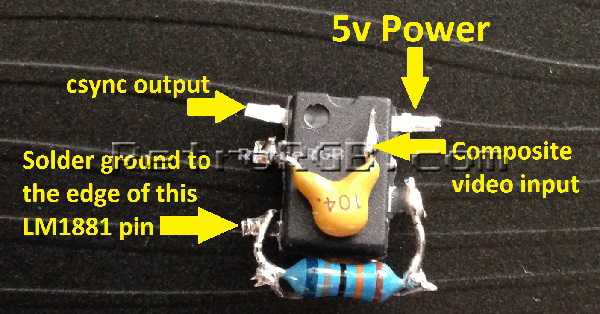 – After you’re done, it’s good to cover the circuit with heatshrink tubing, or non-conductive tape, so you won’t risk shorting it out (or anything else around it). Please note that this guide shows you how to build the sync stripper circuit; It does NOT talk about use case scenarios. 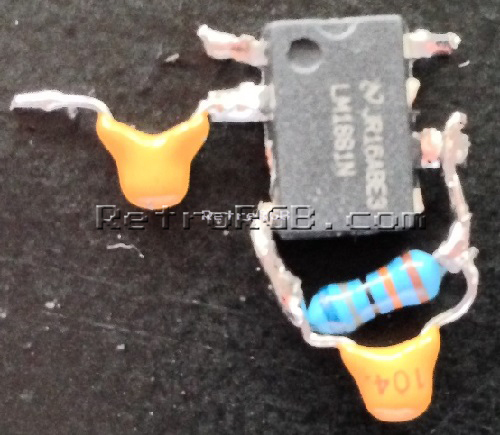 If you’re plugging this into a display or video processor (such as the Framemeister) then you’ll need to add one 470 ohm, 1/4 watt resistor to attenuate the output to 75 ohm video standards. 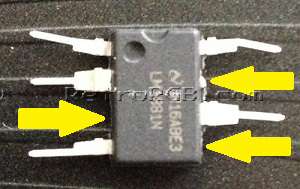 Many RGB monitors accept a wide variety of sync signals, including the TTL sync that this circuit outputs. 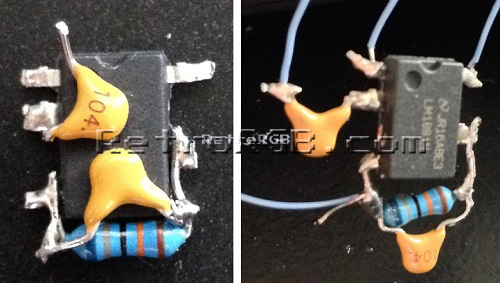 If you’d like to be safe, just add the extra resistor; It’s literally as easy as just soldering it to the output pin. That’s it! A pretty easy circuit that can really come in handy! If you’ve arrived at this page as part of the RGB Guide, please move along to: what method you’d like to use to display RGB. If not, feel free to head to the main sync stripper page, or check out the homepage for everything else we have to offer.